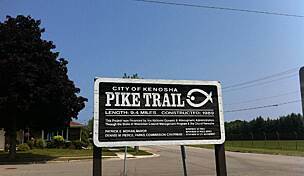 Racine County's eastern edge is home to the MRK Trail, a rail-with-trail that extends north from the City of Racine to the Village of Caledonia. Because Racine County standardized its signs several years ago, you won't see specific rail-trail names on display: look for Racine County Bicycle Trail signs instead. 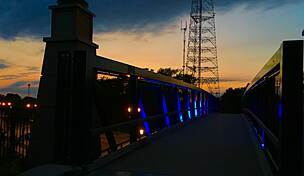 The trail, named for the Milwaukee-Racine-Kenosha rapid transit line that once traveled the route, has an industrial feel to it: an active Union Pacific rail line shares the corridor, and power lines drape the trail. You will notice a very gradual incline as you travel north, which is good news for the swift trip back to the southern end of the trail. 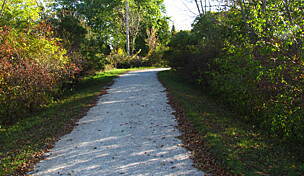 The Root River Pathway, a combination of on- and off-road trail weaving throughout Racine, connects to the MRK Trail at Layard Avenue. 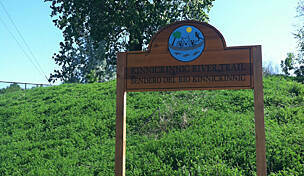 The southern end of the WE Energies Trail is also a short distance from the MRK Trail’s northern trailhead. Use 6 Mile Road, Douglas Avenue/State Route 32 and then 7 Mile Road to reach the trail; take it north to access Milwaukee County. Parking for the MRK Trail is available at the trailhead on 3 Mile Road. Crushed gravel. Rural/urban scenery. Best part is the southern terminus is just a few blocks from the Racine Zoo and Lake Michigan beach! This is a good biking trail it's crushed stone and it's long and straight and it brings you all the way to Cliffside Park where the trail ends. You can ride in Cliffside Park, but it's a small trail it's mainly a good resting stop to relax and enjoy the park which is very nice, but hikers use the park trails the most and some of the trail is cut grass so I would recommend you stick with the MRK Trail for your biking needs. It's a nice biking trail, it's safe and good to ride back and fourth on for some training/exercise, but there isn't much scenery. The left of the trail is powerlines and railroad tracks and on the right is neighborhoods and fast food joints which do make good rest stops for some. So there is no good sights to see on this trail at all so if you want to see great sceneries then this trail isn't for you or you can just ignore all that and just ride. If you make it all the way down you can go left up the road and then take a right at the traffic lights and from there you pass a historical marker which is a good rest stop and if you keep going once you enter Oak Creek there is a new crushed stone trail you can ride on which is great cause you don't have to ride on the road as much. Some areas of the crushed stone can be tough to ride on, but if you ride fast enough you won't even notice and there are a few small hills. It's a not a long trail, but it's pretty decent a nice little ride and it has narrow bridges 1 or 2 if I remember correctly and once you get to the end your back on the road, but it's not far until you make the turn to head towards South Milwauke and the nice bike trails they have like the Oak Leaf trail for example. They go through trees and parks a very nice enjoyable ride, but alot of hills to challenge you once you get that far so be prepared, but still very nice and great scenery and plenty of shade to rest at. 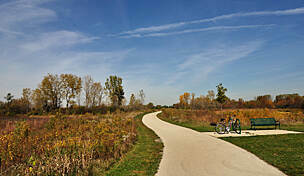 The trails go on for a while through other cites in the Milwauke area making it a good ride indeed. 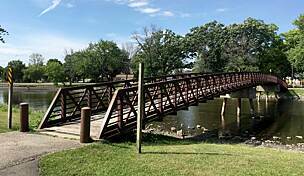 The Root River and Lake Michigan trails can both take you the MRK Trail entrance. As I stated it's a good trail for biking, but as for the scenery there is NONE and there seems to be alot of walkers and dog walkers on this trail. There's bikers and joggers to, but alot of walking happens on this trail, but the people that use the trail are friendly. So it's a good trail for biking, walking, jogging. So good exercise. It's not good for scenery as there is nothing to view or see except maybe some hawks flying around.
" 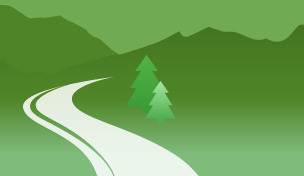 While the description suggests ""urban and rural setting"", my impression of this trail has always been mostly ""YEEECHHHHH"". High tension powerlines and existing railroad lines parallel virtually the entire length of this trail, making it's scenic value (IMO) virtually nil. 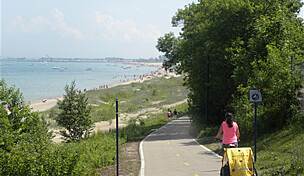 The trail mostly serves as a way to get FROM Racine's north side TO Cliffside Park, without having to travel busy streets. 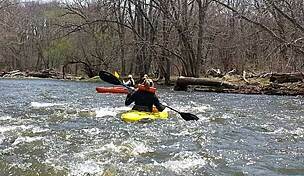 Cliffside park has camping, and a small but enjoyable informal (dirt) trail system which can also be hiked or biked."